"On Memorial Day, we honor all those who have fallen by remembering their noble sacrifice for freedom. We also pray for our troops, their families, and for the peace we all seek." This quote is taken from the program from today's Memorial Day Tribute at the Downey Cemetery. The ceremony was made more meaningful for me today after my visit earlier this month to the American Cemetery above Omaha Beach. The cemetery holds the graves of more than 9,000 American soldiers who gave their lives in the effort to free Europe in World War II. 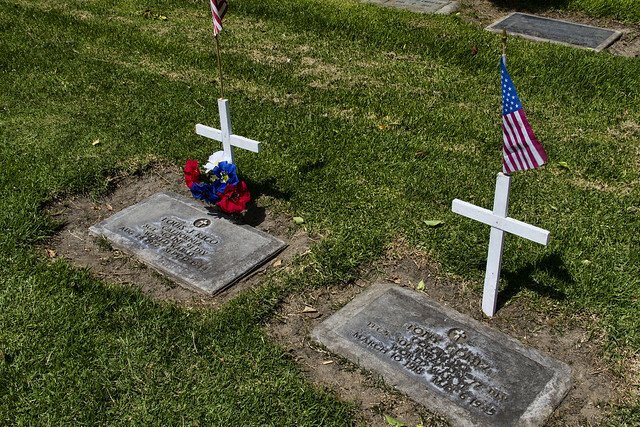 The Downey Cemetery isn't nearly as large, but the grave of each veteran is marked with a cross and a flag, and it's humbling to realize how many of those who are buried here have sacrificed to serve their country. Thank you to all who serve.